On a Personal Note: Reality TV, 1940’s Style. I’ve been watching 1940s House, the 2001 BBC series in which a family recreates the living conditions during war time Britain. It’s a really excellent show; I find the British versions of the “House” shows to be much more fascinating. They cast people with a sincere interest in history, and I think it makes for a better show than the American version, which leans more towards reality tv and drama drama drama. The shows also features several appearances by Marguerite Patten, and a focus on rationing and food prep in the ’40s. The show is well worth adding to your Netflix que. On Wednesday, I baked three more loaves of sourdough bread. I still don’t quite have my technique mastered, but I’m getting close. It let it rise longer, and I baked two loaves at 450 with the lid on for 20 minutes, and the lid off for 30 minutes. I also tried using a loaf pan, instead of the Pyrex casserole I have been using. It was still dense–I think I’m going to have problems getting the bread to rise until my steam heat gets turned in. My apartment is chilly is the fall. 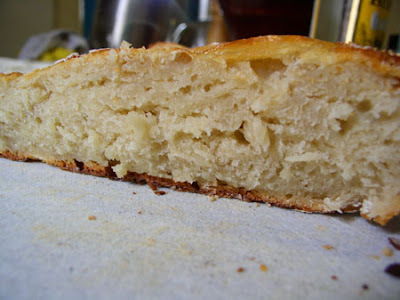 Additionally, the bread tasted more like a classic sourdough than the cheesy bread I made last week. It’s from the same starter, so I don’t get. I guess when you’re cooking and eating living animals, their always going to be some variation. The prettiest loaf of them all will be traveling with me to our nation’s capital, where I’m visiting my friend Bryan this weekend. We’re going on a historic food adventure which includes a trip to the cafe at the Museum of the American Indian and a visit to George Washington’s distillery. More on that next week. 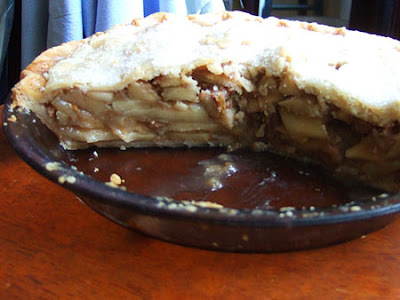 Retronovated Recipes: 400 Years of Apple Pie — Bonus Feature!! I want to follow up on my apple pie exploration with this little gem: my roommate reading aloud the 1615 Pippin Pie recipe. The time has come to bake bread from the starters I have so laboriously cared for! After poking around for a simple bread recipe, I can across the video from the New York Times. 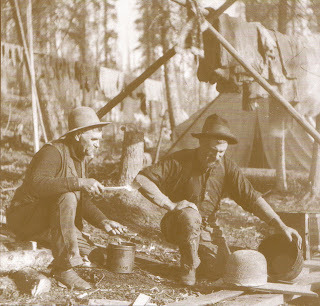 I selected this recipe because I had seen this photo from Simply Sourdough the Alaskan Way, of two turn-of-the-century gentleman making sourdough in cast iron pots. The recipe is so simple, I figured it had to be relatively similar. 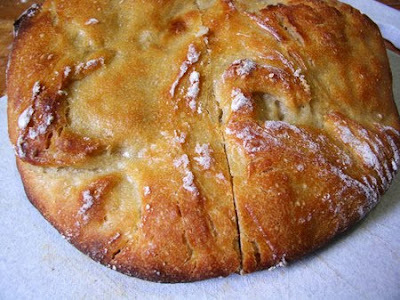 I found the recipe adapted for sourdough here. When I busted out my Astoria (nee New York) Sourdough Starter and gave it a sniff, the smell had definitely mellowed from stinky cheese to almost imperceptibly sour. After scooping out a cup of starter for my dough, I added a cup of flour and 3/4 water back into the starter, mixed it up, and let it sit out for about 6 hours before I put it back into the fridge. Use distilled or bottled water; tap water could be chlorinated and will kill your yeast friends. I prepared the bread according to the recipe above, starting with the Astoria starter. The loaf came out of the oven a little weird looking: shiny, burnt in places, and lopsided. The latter is the fault of my oven, which, like my floor, slopes to the center of the room. Despite its suspicious looks, the bread smelled delicious. Like Parmesan cheese. I really should have let the bread cool, but I was excited, and my roommate talked me into slicing it open. It was incredibly dense, and I deduced that I had not let it rise long enough. We tasted it anyway: it was wonderful. 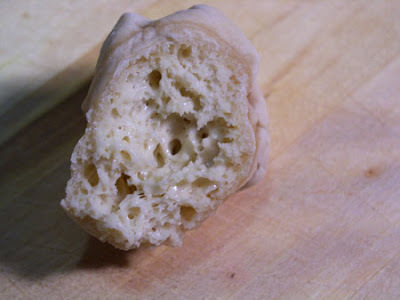 Like a Parmesan cheese bread, that occasionally also tasted like baked macaroni and cheese. It was delicious. I could have eaten it all day. I was amazed. I had literally created this bread from nothing. How can so much flavor come from a mason jar full of flour and water on my windowsill? After having to throw away so many starters to get here, the whole thing just seemed like magic. I put the Alaskan sourdough into the oven next; it rose slightly better, and the result was slightly less dense. But nowhere near as flavorful as the Astoria Sourdough. The New York bread was hands down our favorite. Both loaves came out too dense. I don’t think I let either loaf of bread rise long enough: I hit closer to the 8 hour mark instead of 12. Bittman even recommends letting the dough rise for another 2 hours after you pull it out of the bowl and fold it over, which may be worth a try. Bittman also suggests cooking at 450 for 30 minutes with the lid on, the 15-30 minutes with the lid off. I am going to try his cooking temperature next time, to see if it prevents burnt bits. 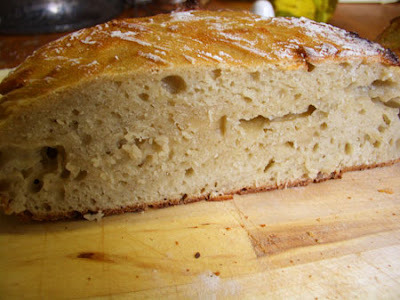 The flavor of Sourdough bread varies by the region in which it is baked: sourdough was baked in San Francisco and Alaska because itinerant men needed to start their own yeast cultures; the sourdough from these regions became famous because of the particularly tasty local strains of yeast. New York yeast apparently tastes like mac and cheese. The New York Times ran this infatuating article on different bacon brews across the country. The Times also had a rather inspiring article about vacationing in my hometown of Cleveland. Two items of interest in the article are the Velvet Tango Room, a Tremont bar housed in an old speakasy that features home-made bitters and a bevy of classic cocktails; and L’Abatros, the new French restaurant housed in a 19thc carriage house on the Case Western Reserve University campus. Edible Manhattan reminds us that the Bloody Mary is turning 75 on October 5th; head over to it’s origin point at the St. Regis hotel to get one. I did a video with The Feedbag at the annual, South American-style pig roast at Il Buco. The prized pigs in the spotlight? An 150 lb Ossabaw and 250 lb Crossabaw (ossabaw crossed with a modern breed). Watch the video to learn more about these breeds, and to see some serious pig fat action. The 19th Century Pub Crawl a Great Success! Downing the Original 1864 House Ale at Pete’s Tavern. Photo by Ilana Kohn. I am pleased to report that the 19th Century Pub Crawl was a rousing success! Over forty people turned out and we covered five bars, from E 4th st. to E 55th. A small group even made it all the way to PJ Clark’s. We were a motley crew, all ages and backgrounds, brought together by our mutual love of history. Additionally, there were some impressively costumed ladies sporting full 19th century garb, corsets and all. A couple fine gals even came straight from their jobs as historic interpreters at Old Bethpage Village. I don’t think a more convivial group could be found anywhere on the streets of New York that night. We began our crawl at Swift, a modern bar whose decor and cocktail menu are inspired by the writings of Jonathon Swift. 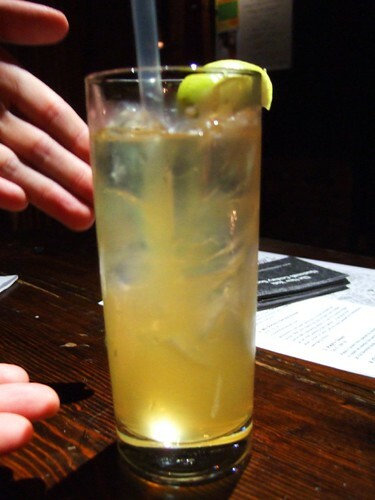 I tried one the bar’s original cocktails, the Captain Gulliver, a combination of Jameson, Ginger beer, and lemon. I had wanted to try the ginger beer, which is so 19th century, but it was non-alcoholic. This cocktail was the perfect solution. Next I led the group to McSorely’s, who have been serving their light and dark house brew since their establishment in 1854. The light beer allegedly tastes like cream soda. I ended up not going in: McSorely’s is a cornerstone of drinking at NYU, so the bar was already packed by the time we arrived at 6:30. Half of the crawl decided to stop in, and met up with us later, while the rest of us continued to our third stop, Pete’s Tavern. Pete’s is also known for the house brew they have served up since 1864. It looks like a dark beer, but tastes like Miller Light. This beer marked a definite turn in my sobriety and in the sobriety of my cohorts. The interior was beautiful, the bartender gracious, and the staff incredibly tolerant of our drunken antics. I’d stop in Pete’s any day. Next, we headed down the street to nearby Old Town Bar. At this point, we were famished, so several of us gorged ourselves on the bar’s delicious burgers and fries. I also sent my friend Marc to gather reconnaissance in the men’s bathroom. 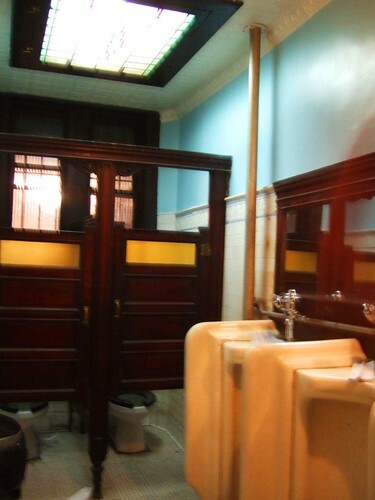 The marble urinals, “made by Hinsdale in 1910,” are impressive enough that Old Town mentions them on their website. The tavern’s dumbwaiter is also the oldest one operating in the city, and pretty cool to see in action. Right: The infamous urinals. Overall, a beautiful bathroom. Lastly, we grabbed a cab and headed uptown to our final destination: PJ Clark’s. After gorging ourselves (again) on a plate of onions rings so crispy they taste like green bean casserole, I noticed that they had an oyster bar. I was thrilled. “How Victorian!” I squealed. 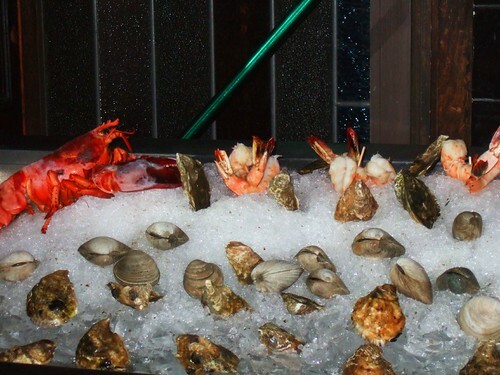 In every period source and novel I have read, haughty men are slurping down bivalves by the plateful. I’d never had an oyster before, so I ordered one for myself and one for Marc. To be honest, I was expecting something squishy and revolting, and misery loves company. We loaded up with condiments and sucked them down, and were surprisingly not disgusted. They just tasted like salt. Or maybe I was wasted. The spread at PJ Clark’s. 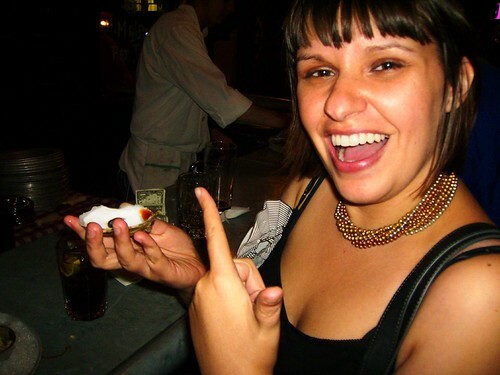 Eating my first oyster. I look enthused. My evening ended by climbing into a cab bound for Queens. Upon arriving home, I left a trail of my clothing and personal items from my front door to my bed, where I promptly passed out. The next morning, I felt as though I had been struck by a moving carriage. If this were the 19th century, I’d be one step away from McGurk’s. To see more photos from the event, swing by our group on Flickr here. And if you’re a Flickr member, and attended the event, feel free to add your own photos to our group pool. 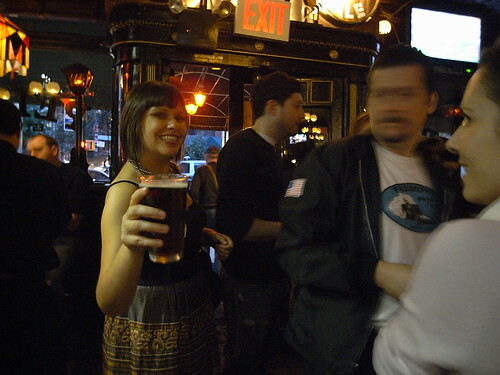 We’re already planning another crawl this spring, following the bars on Manhattan’s west side that formerly served the harbor’s sailors, seamen, and other rugged sorts. And is New York the only city where a woman can wear an 1860’s dress with punk-red hair and not be looked at twice? We’re going to find out, because we’re bringing the Crawl to Boston. Stay tuned for more news. 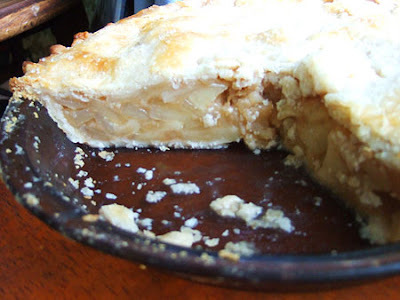 I believe apple pie is one of the greatest pleasures of the fall, second only to all things pumpkin flavored. 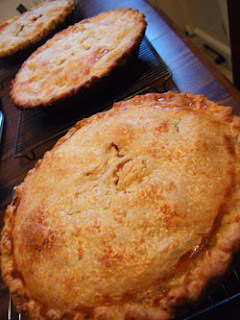 Over the weekend, I baked three apple pies from three different centuries: the 17th, 18th and 21st. In each recipe, the flavours are so distinctive, so apropos of their respective time periods, that I’ve felt an unrelenting urge to make them at once and let my palette travel back through time. I baked these pies with the assistance of my mother. I hope that through our experiment, you find inspiration for your own fall pies. In preparing these pies, I decided to keep the method for making the pie consistent, and let the flavorings be the variable. This approach is historically accurate: most old recipes are only a list of ingredients; after years in kitchen, cooks would already know how to prepare something as simple as a pie. Use the crust recipe of your choice, or get a store bought crust. For the filling, use a mixture of softer apples that will break down with cooking, and firmer apples that will keep their shape. I used a combination of Ginger Gold, Gala, and Paula Red apples, about three pounds in total. To prepare the filling, I followed Pam Anderson’s recipe from her book, The Perfect Recipe. After the filling is cooled, fill the crust, and don’t forger to cut vents in the top. Brush the top crust with a half and half mixture of cream and egg yolk to get a nice golden brown color in the oven. Bake it for 15 minutes at 375, then 20-30 minutes at 350. The pie is done when the filling begins to bubble up through the crust. 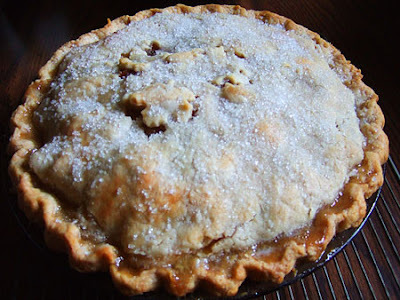 The oldest recipe in my pie time machine is from The English Housewife, published in 1615. I came across it in the book 1,000 Years Over a Hot Stove in a chapter on colonial cooking. The Modern Recipe: The original recipe uses whole apples, whole cloves, chunks of orange peel, and shattered bits of cinnamon stick. In the 17th century, grinding spices would have been a laborious process, and not economical for making an everyday dessert. 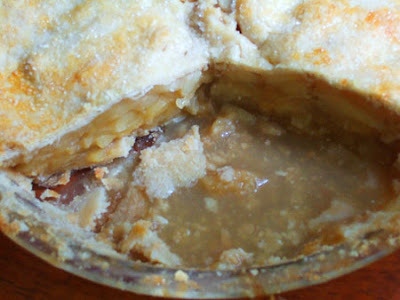 I updated the recipe by using ground spices and orange zest, which make the pie easier to ingest, while still maintaining the original recipe’s unique flavor profile. I cooked the chopped dates in with the apples; they began to disintegrate and thicken the sauce. A coffin, by the way, is the pie pastry. The Results: While the pie was baking, the combination of spices made the house smell like Christmas. But when it came time to eat, the orange and clove made the pie taste exactly like a pomander. I think if I were in the 17th century I would have loved it, but nowadays I hate eating potpourri. On the contrary, my friend Sarah Tea loved this pie. It was her favorite of the three. This recipe is from the first American cookbook, American Cookery by Amelia Simmons. The Modern Recipe: Mace is an extremely zesty spice and can over power a dish in a large quantities. Conversely, I added a hearty dose of rosewater, which adds a bright, cirtusy flavor instead of a perfumee one. A recipe appropriate to the 19th century can be made by substituting cinnamon with nutmeg. This recipe comes from Amy Sedaris’ book “I Like You: Hospitality Under the Influence.” I won’t include the entire recipe here, due to copyright issues. My recipe was inspired by hers, but stuck to my own methods. Caramelize 1/3 cup sugar over a medium-low heat. When it is a little darker than the color of honey, remove from heat and slowly add the bourbon. Return to heat to dissolved the sugar, and reduce into “a thin sauce.” Stir into the apple pie filling after the filling has been cooked, but before it has cooled. The Results: My mom loathed this pie and claimed “the taste was burning her tongue.” This pie was actually my favorite. The flavor seemed the most modern, and was the easiest for my pallet to accept. And I do love a glass of bourbon. There you have it: Three pies. Three centuries. All apple pie in spirit, but all distinctly different. I want to let you in on a few things going on in my life. First, I wanted to show off my gorgeous new pinner apron, made for me by Eva of Circa 1850 and The New York Nineteenth Century Society. She hand-sewed my golden pinner using a pattern from a period source, The Workwoman’s Guide, published in 1840. I am so excited to break this baby in. I love pinners. They look so smart. Second, here’s my second video with Eric at Fancyfastfood.com. We visited New York’s Miss. Softee, one of the few ice cream gals in the city. You can follow here on Twitter to get updates on her current location and specials for the day: http://twitter.com/miss_softee Stop by her truck soon, she’s only open until the end of September! Lastly, the 19th Century Pub Crawl is next Saturday, the 19th. After three days, the Alaskan Sourdough was ready to rock. It smelled sweet and yeasty. But I’m not really surprised, since the yeast culture is actually the result of the beer. Still, I’m looking forward to baking with it.What I’m really excited about is the New York Sourdough. 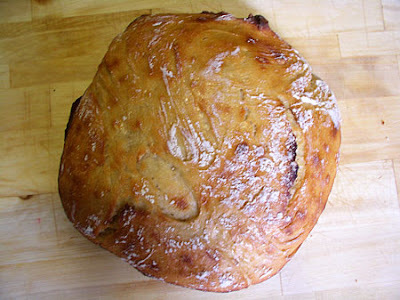 As promised in the Science of Cooking Recipe, after three days the bread was dry on the outside, but inside it was bubbly with the arrival of transient yeasts making a home! And the best part? It does not smell like cat puke. It smelled “slightly sour,” the way it should. Continuing to follow the recipe, I added 1/2 cup of flour and enough water to work it into a dough. I placed it back into the mason jar for another two days, and when I came back it was a blob of yeast bubbles. And the best part? IT STILL DOES NOT SMELL LIKE CAT PUKE. It smells like a ripened cheese. The only disheartening bit: after I pulled off the dried outside, there was a mysterious greyish spot in the center. I decided to continue the experiment, at a possible risk to my personal health. I added another cup of flour and a cup of water, and let it rise another twelve hours. Both of the starters are ready for baking, but unfortunately I am leaving town for the weekend. I plan on baking two loaves of bread, one from each starter, when I return. I feel as though I am one step closer to surviving on the Oregon Trail. Next, I’ll practice typing BANG really fast. In the meantime, I’ll be baking apple pies with my mother in Ohio, using 17th, 18th, and 21st century recipes. I am giving this sourdough starter thing one more chance. Please bare with me. I’m obsessed with making sourdough for two reasons: 1. Because I feel like a magician. Making bread appear–out of thin air!– in my mind is akin pulling a rabbit out of a hat. 2. Because I know it was done in the past, so I am determined to figure out how it was done. My mother thinks that some 19th century knowledge, like wild yeast starters, have just been lost to the ages. But I’m determined to rediscover it. So off I go to grow some pet yeasts. This time, I’m attempting to make a yeast starter using two different methods. 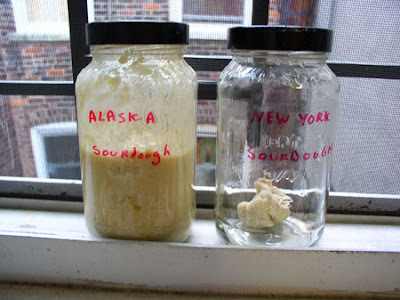 The first is courtesy of my friends Kristina and Chris in Alaska, who discovered a local woman who makes bags of pre-packaged yeast starter. They cornered her with questions on my behalf, and purchased a bag of her started as a gift to me. I don’t know what the ingredients in her dry starter mix are, but I followed her instructions added a 1/4 cup of luke warm water and 6 ounces of beer. I had a Sam Adams Boston Lager in the fridge, so I poured half of it in a mason jar (I poured the other half of the beer in my roommate), and mixed it thoroughly with the dry ingredients . I placed the cover loosely on the mason jar, and set it on my windowsill to warm up and catch some yeast. In three days, it should be ready to roll. The second method I’m trying is from The Science of Cooking. It’s slightly different than other wild yeast starters I’ve tried: you take a small mound of flour and mix it with a little water until it turns into a paste. 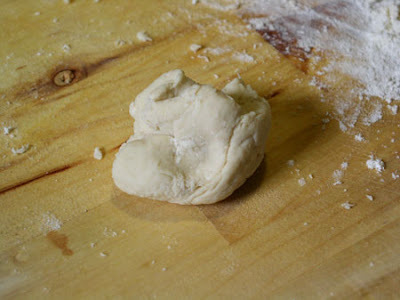 Continue kneading it, 5-8 minutes, until it become a springy ball of dough. I tossed that in a mason jar and covered it with a damp towel. 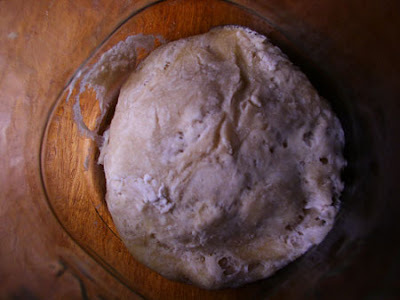 In a few days, it should start to get yeasty, and I’ll add more flour. It will hopefully catch some New York yeast, so I’m calling it New York Sourdough. A little ball of love. They still use the same recipe as they did in ’49, and little molecules of 1849 yeast are still awash in their starter! Awesome! I am really looking forward to visiting the bakery someday. I wanted to share with you two videos that I am particularly proud of. I did them both recently for The Feedbag. The first profiles Sylvia Weinstock, New York’s premiere wedding cake maker. She’s been in the biz over thirty years and is completely adorable. Her wares come at a price, however. She quoted $600 for a two-layer shower cake. The second video I made with Erik Trinidad of Fancyfastfood.com. While I can’t direct relate it to historical cookery, I wanted to share this video with you because watching Erik transform Chicken McNuggets into a high-end confit is just plain fun.